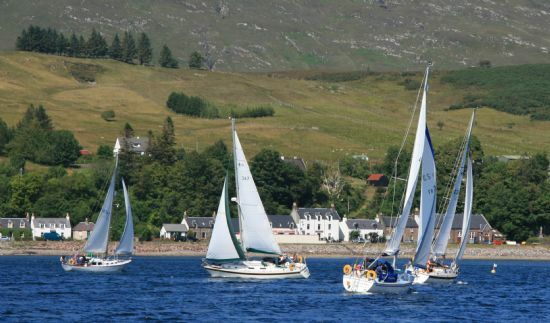 Welcome to Lochcarron Sailing Club. We are a small, locally based club. We run regular dinghy racing and training throughout the Season from April to October. These are usually held on Sundays. Check out our programme for more details. Taking out a short term membership for half the annual subscription will enable you to take part in any club activities, including the use of club boats during these activities. See the programme for planned activities and the membership page for subscription details. Visitors may be asked for proof of competence eg RYA qualifications before using club boats. For the most up to date information click on the News Tab. The other Tabs are self explanatory - feel free to browse! Yacht racing is a regular event at weekends. Finally, download a membership application form here or from the "Join the club" page if you'd like to become a member. We would welcome your comments and greetings via the "Club Forum".